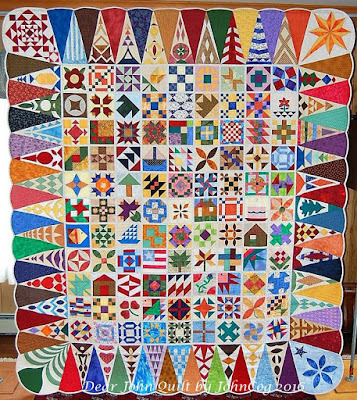 Do you remember the blocks I did to celebrate the first day of Winter? Not that I like winter, but for me that means that the days get 1 more minute of sunshine from then on! 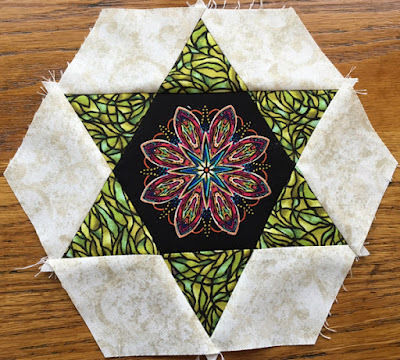 Paula's panels with the large kaleidoscopes also have smaller motifs at the selvedge ends. Let me show you what I did with those! And here are two more blocks I made using the smaller motifs. Yes, I've been so captivated by these! 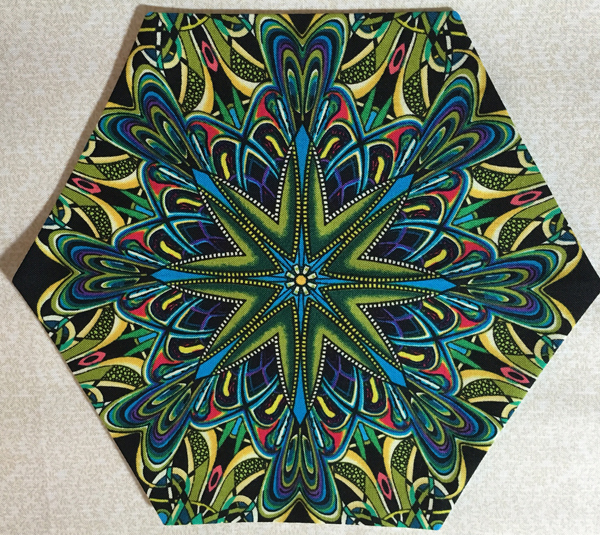 This one is called "Sarah" in the book "The New Hexagon." 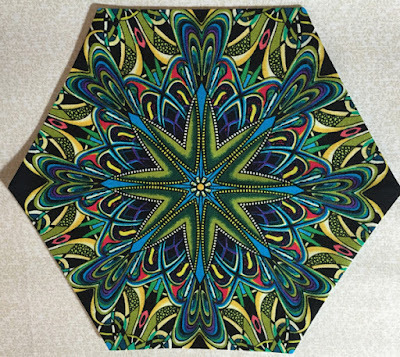 Paula has a new collection out now called Chromazone (also by Benartex). I'm getting some and will be sharing that in the next month. I received an email last week from John of Maryland. 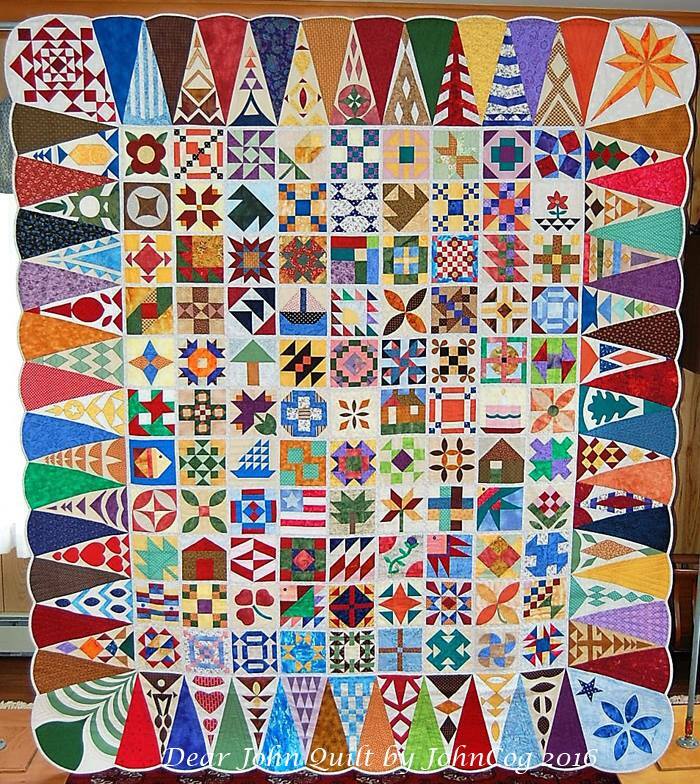 He wanted my permission to display his quilt in a county fair this summer. That was super courteous of him and not necessary. Of course, I said YES! 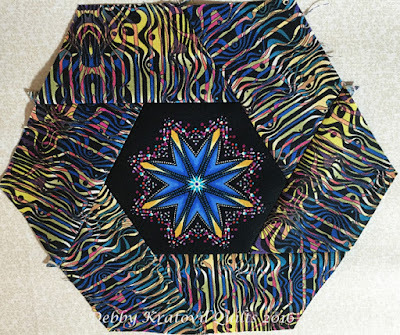 He used 99 of my 366 quilt blocks from my Quilter's Block a Day Calendar for the quilt center. He resized them all to a uniform 6". 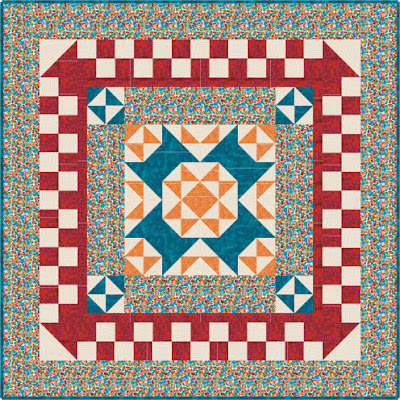 His inspiration was the Dear Jane Quilt (patterned from an historic quilt made in 1863: The Jane Stickle Quilt). 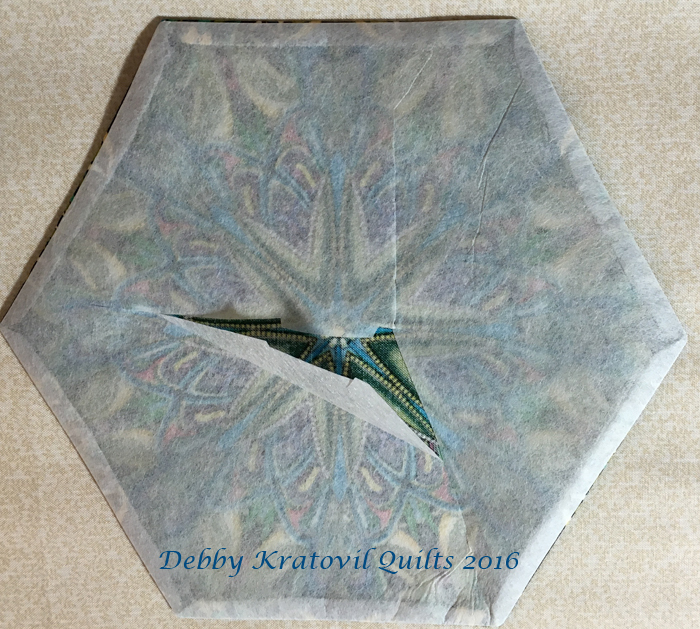 He created some of his own outside triangle patterns and used some from the book by Brenda Papadakis. 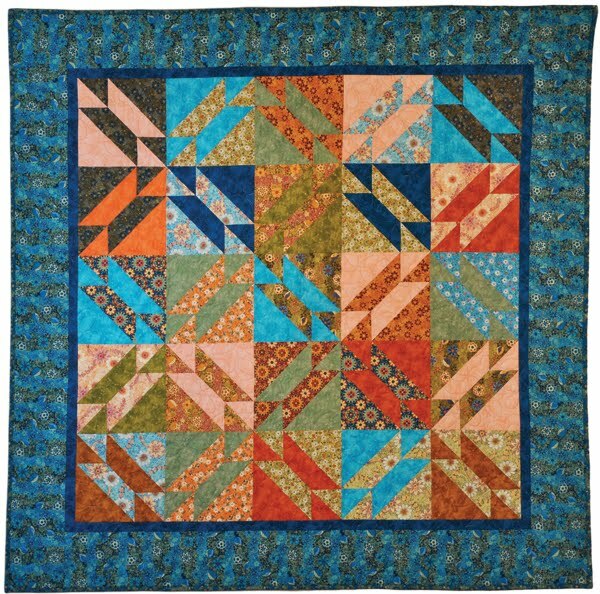 His sizing is unique (the Dear Jane blocks finish to 4-1/2" square). 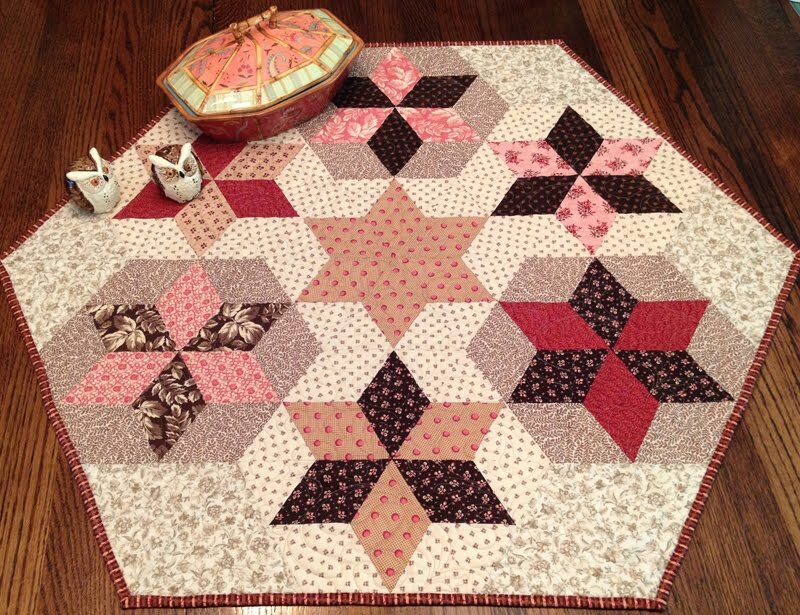 And here's the Dear John Quilt! 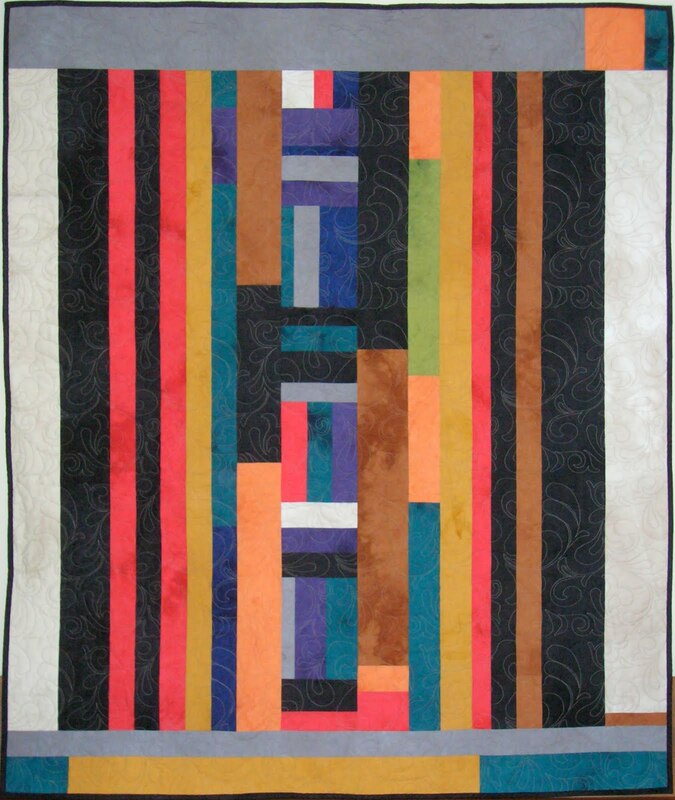 I am truly humbled and honored that John used 99 of my blocks in this quilt. I am confident he will win a blue ribbon for his work. And the colors are so awesome! Thank you, John, for letting us feast our eyes on this. 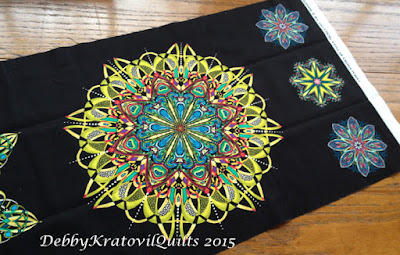 And I keep rotary cutting and stitching with those Paula Nadelstern motifs. 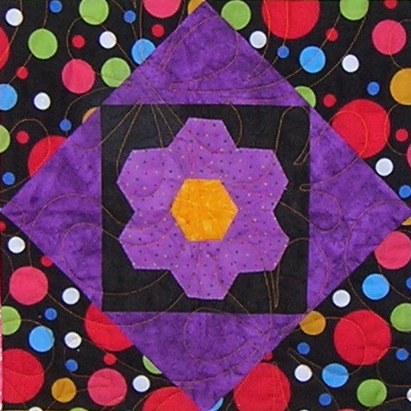 I have 6 stars which will be sewn into a ring and then I will put a fussy cut larger motif in the center. What's your super power? Here's the magical center. 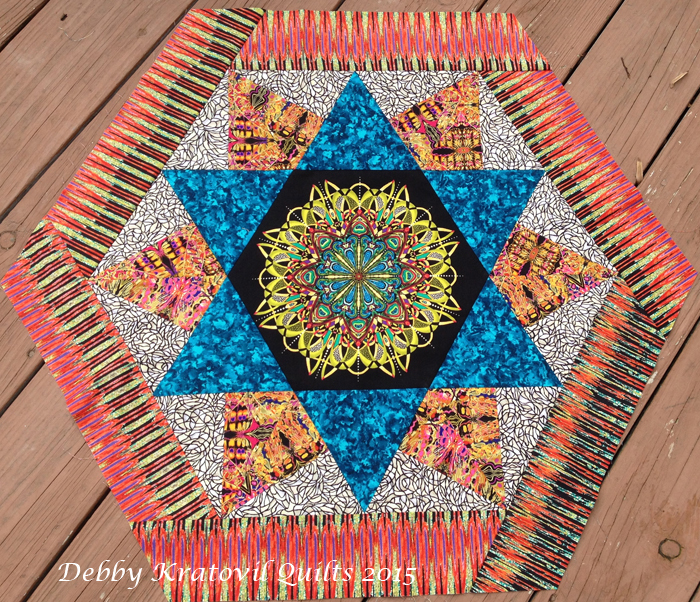 Paula Nadelstern has the super power, not me! Because I'm out of town and not near a sewing machine, I'm not able to stitch this together. But everything's ready and waiting at home. My dog can't figure out the sewing machine or it would be done by now! I'll keep you posted. I'm sure you've noticed how enamored I have become with this fabric. 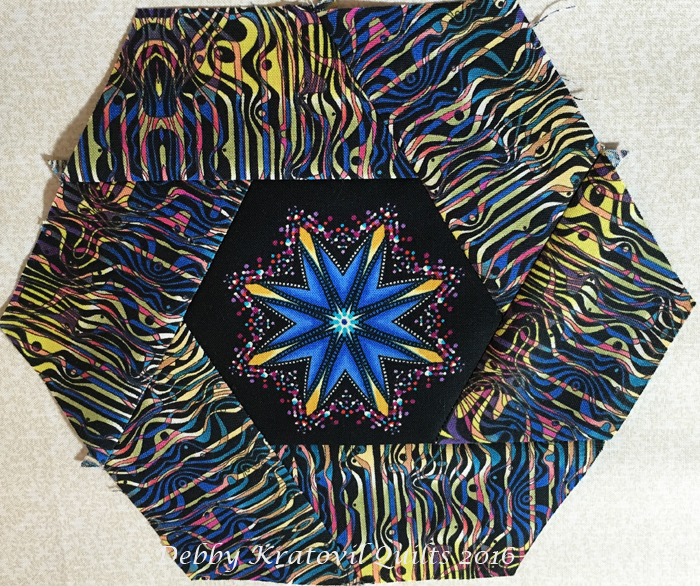 I discovered that I could fussy cut [center a motif in a specific shape] the kaleidoscope printed images on the Paula Nadelstern Fabracadabra panels I have. I realized that they work beautifully with 1-3/4" hexagon papers. 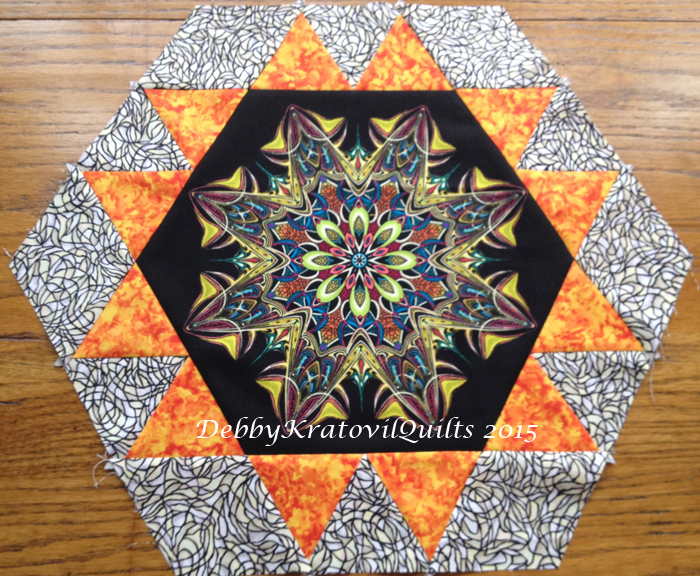 The companion fabrics create quite a striking "flame" stitch, don't they? 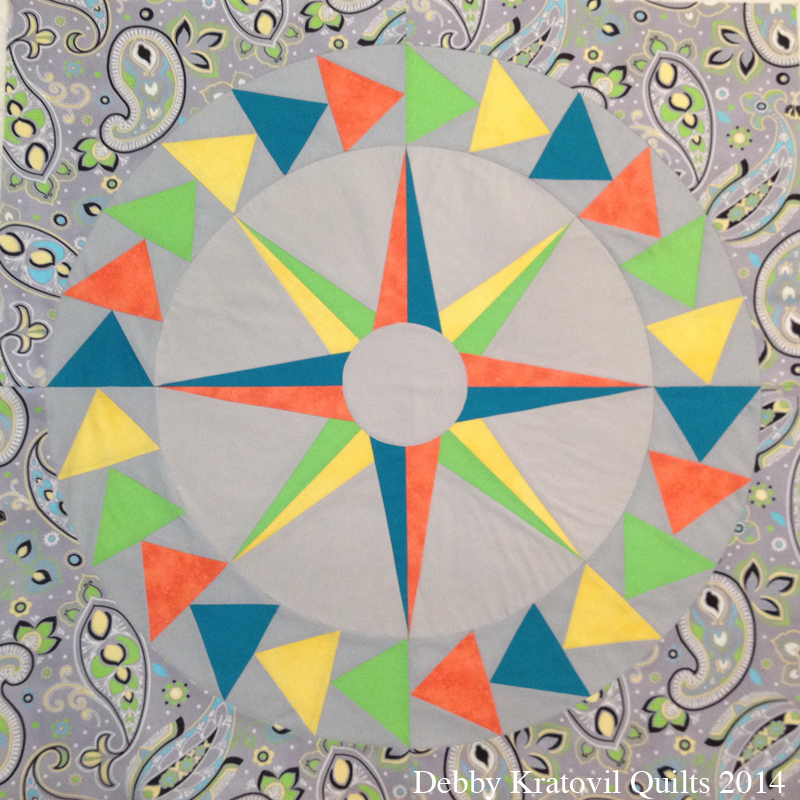 Then I realized that I could make the motifs the center of a 6-pointed star. 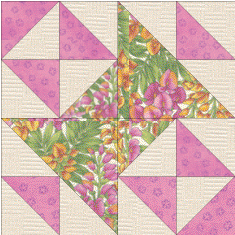 There are NO set-in seams; all straight seam sewing for this block. Magical, huh? I used these panels in a previous post, Here Comes the Sun. 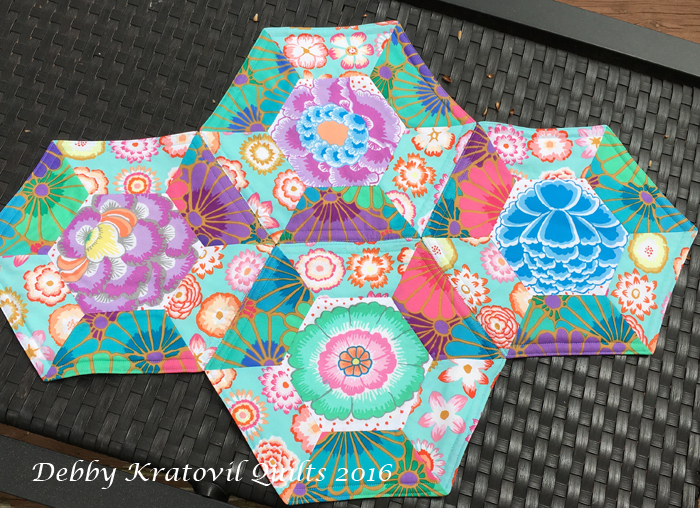 The larger motifs are fabulous to play with and though they are technically octagons, I was able to turn them into hexagons. 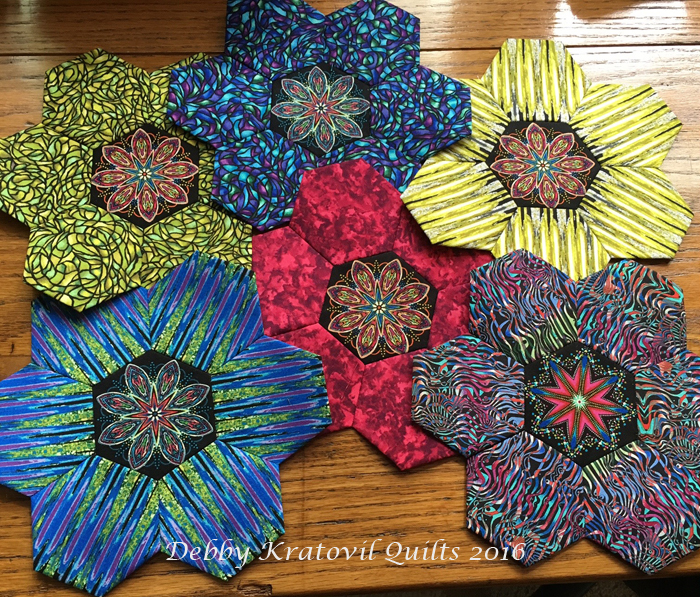 I made 6 different 6-Pointed Stars and plan to sew them into a ring and add a center cut from the larger motifs. 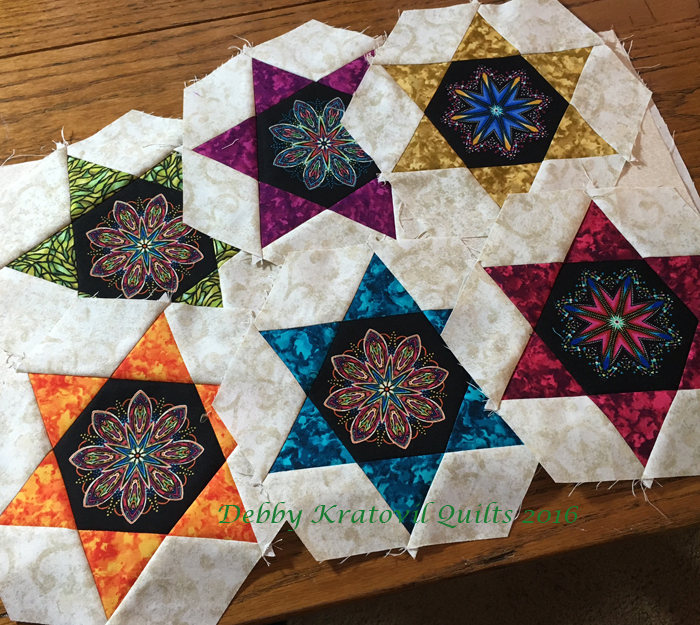 All is ready to go, but I'm on the road again tomorrow until Saturday night and for some reason my husband and dog still don't know how to work my sewing machine! Sigh. 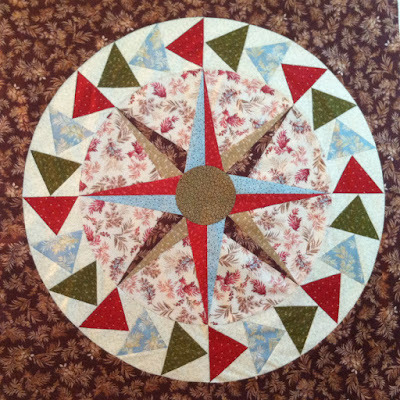 You can see the original table topper at my Craftsy store. This was so quick and easy. 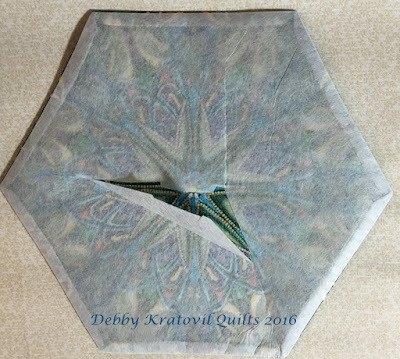 Both the half and whole hexagons are cut from a multi-sized 60 degree ruler. No set-in seams. I bet you didn't know you could do that! 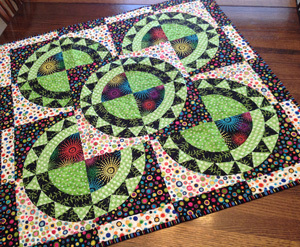 No need to rely on templates - you can cut any size you want with what I call my "Power Tool." A great way to showcase your luscious, large scale prints! Memorial weekend in Des Moines? 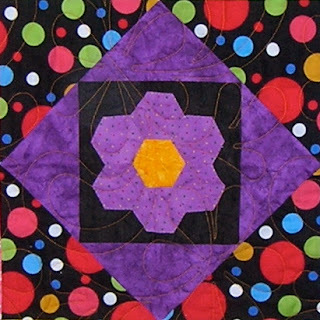 That's where I'll be and teaching 5 classes at the Quilts of Valor Show. Let me show you the projects and if you're in town (or know of someone in that area), I'd love to have you consider taking one! 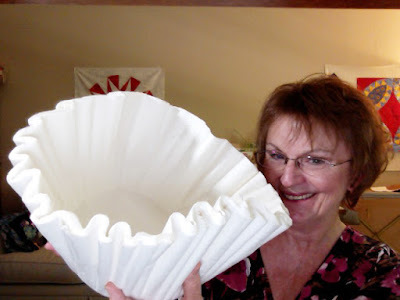 Coffee Filter Mariner's Compass - yes, you read that right! 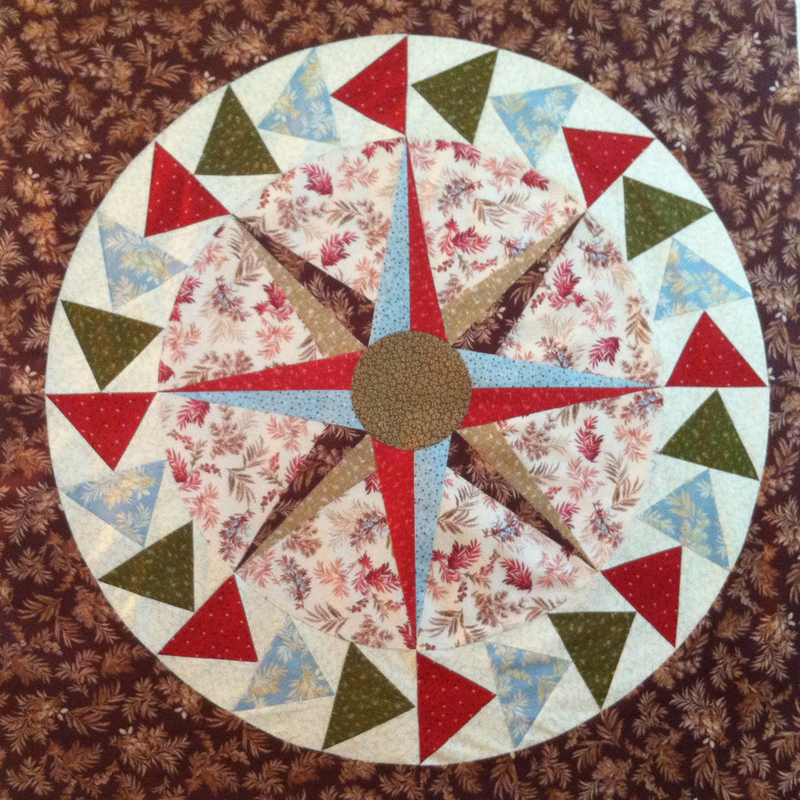 A wonderful new way to create the popular Mariner’s Compass, precise points and all. Begin with a 100 cup coffee filter (20" diameter) as your base. 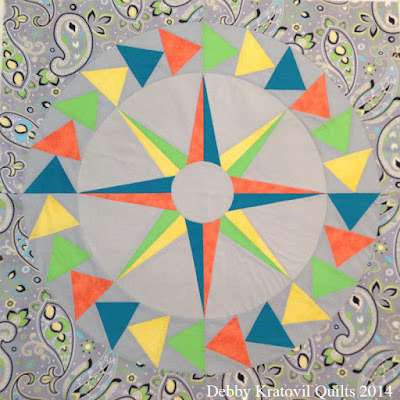 Draw a few lines, foundation piece the center spikes, add a halo of flying geese and learn how to sew the curved background pieces to finish this stunning 32" Mariner's Compass quilt top. 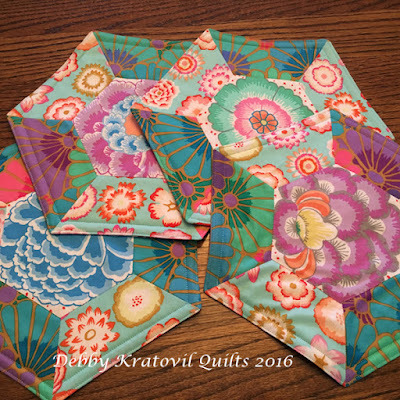 Bring your own fabric, see supply list for details. Yes, they are 20" in diameter! Don't you just love the grays for a background? 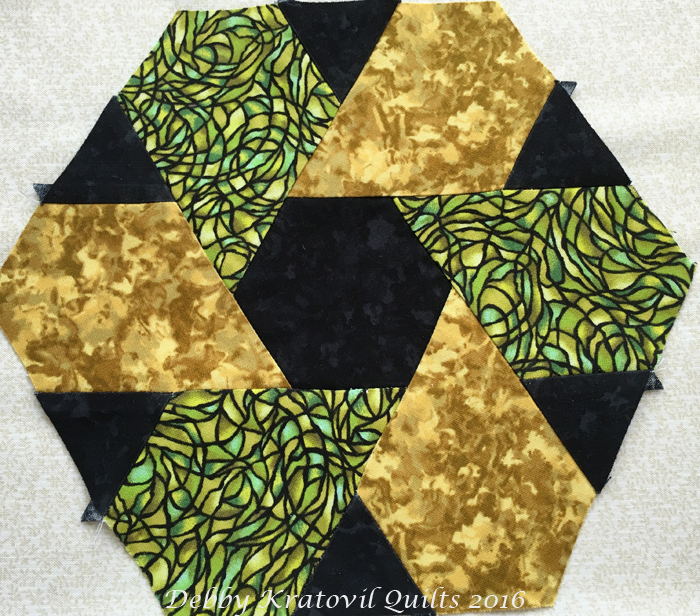 Satisfy your desire to learn both paper piecing and working with curved units to create this dynamic Ezekiel’s Crown quilt. 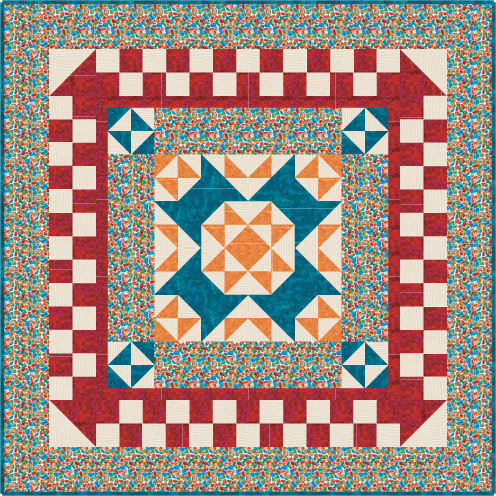 Composed of 16 blocks that are arranged in my “when 4 makes 5” assembly system, the magic happens in how we turn the blocks. 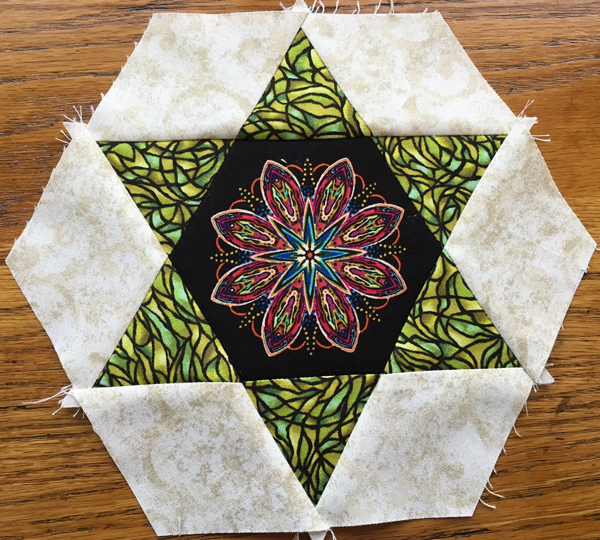 While this isn’t a project for beginners, it is certainly enjoyable - and doable - for those who are confident with their piecing skills. 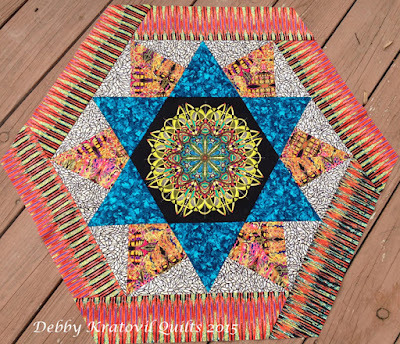 Includes master pattern, all templates, several printed foundations, nicely illustrated instructions and Debby’s helpful, practical and easy to follow direction in class, of course. 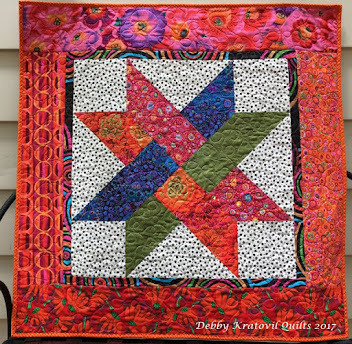 Bring your own fabric, see supply list for details. Choose multi-colors as Jane H. of Maryland did! Modern Vortex - or two colors! 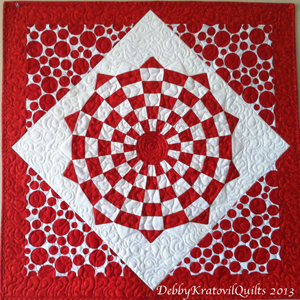 Using Debby's KISS Method (Keep It Small & Simple), discover how liberating free-motion machine quilting can be. Discuss threads, batting and basting, then do lots of PRACTICE. 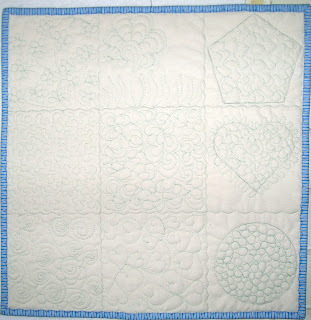 Doodles, swirls, curves and other simple shapes gently guide you into this exciting world. 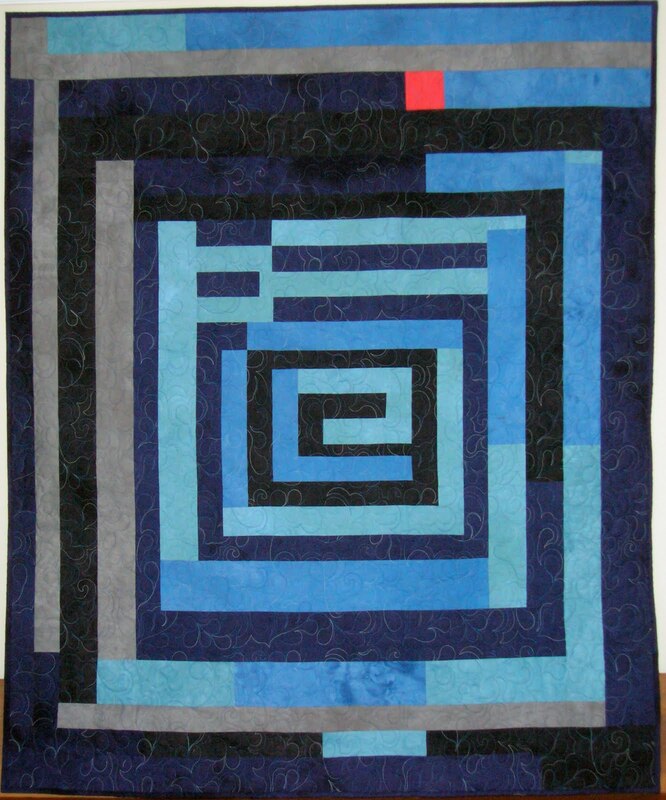 Excellent for both beginning and intermediate level free-motion quilters. Hexagons are once again taking the quilt world by storm! 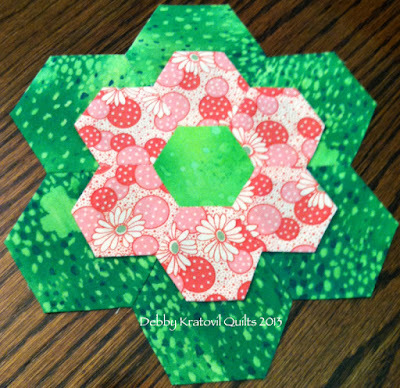 This great take-along project is perfect for making Grandmother’s Flower Garden (GFG) blocks. 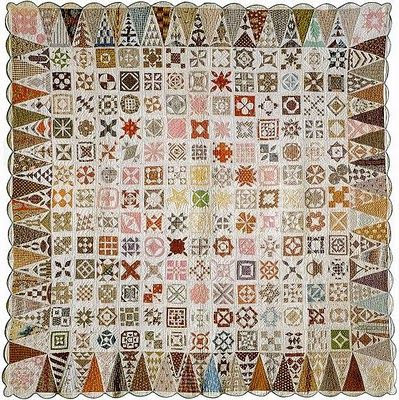 Learn the simple art of hand stitching with the English Paper Piecing technique – the creation of a block or entire quilt using a paper template for uniform units. It can be both beautiful and addictive. 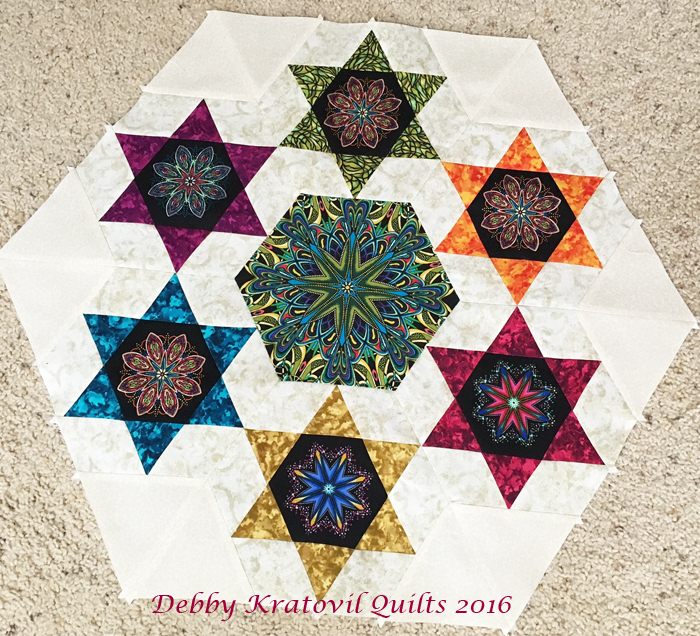 Debby’s collection of samples is a treasure trove of inspiration – all sorts of ways to use your blocks in a variety of settings and flavors. I bring a LOT of samples and projects made with my blocks, along with pre-cut fabrics with papers for making several sizes of blocks! Kits are provided for you. 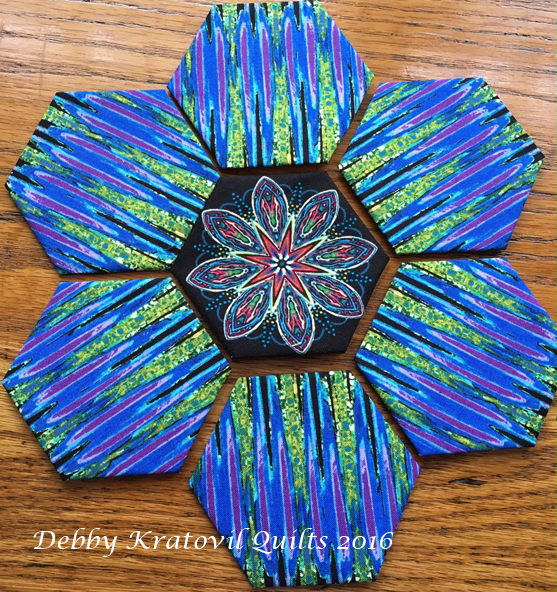 So, if you're in the area or want to travel for the American Quilts Expo (Quilts of Valor), please do consider my classes! 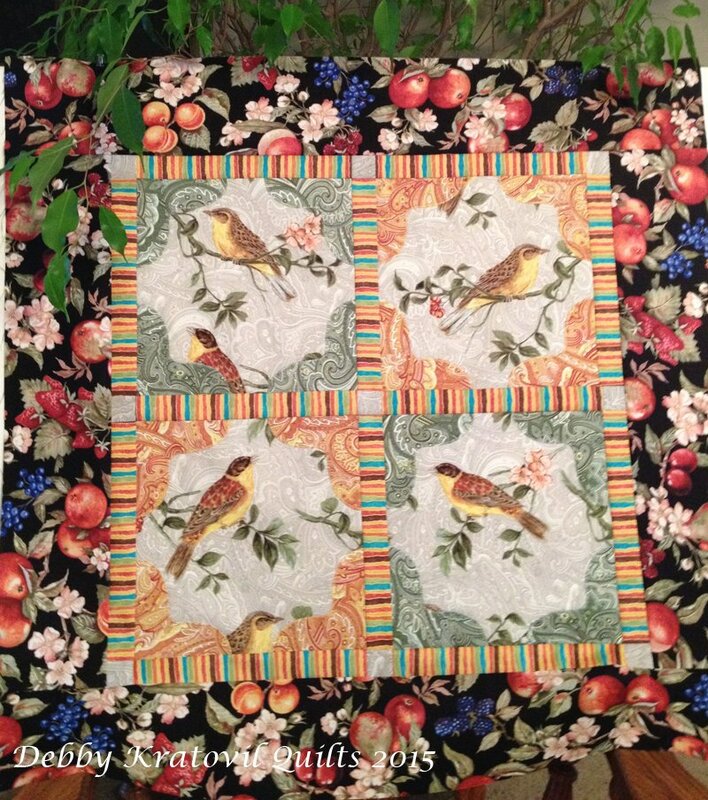 Here is our 4th project in my 2016 Calendar Girls Program. I hope you've enjoyed what we've had so far and you are keeping up. 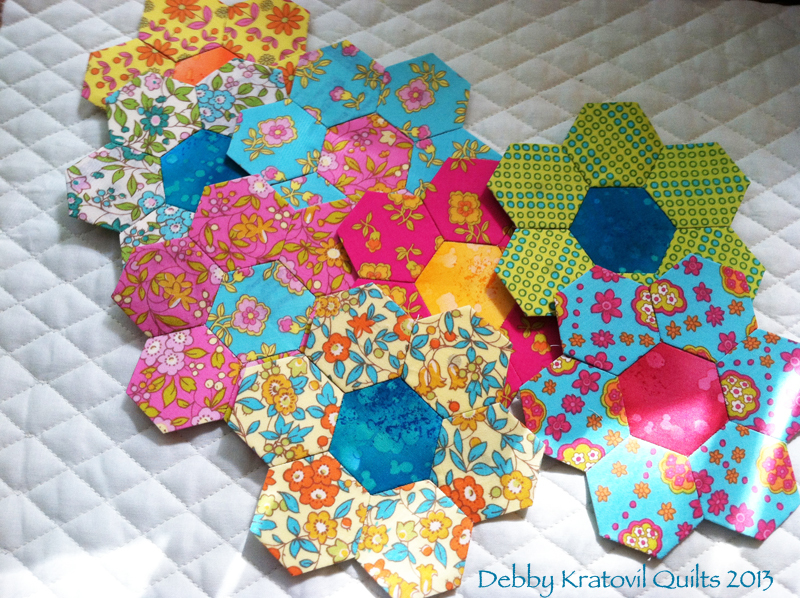 Even if you aren't, at least you can save the patterns for when you have some extra time to play. 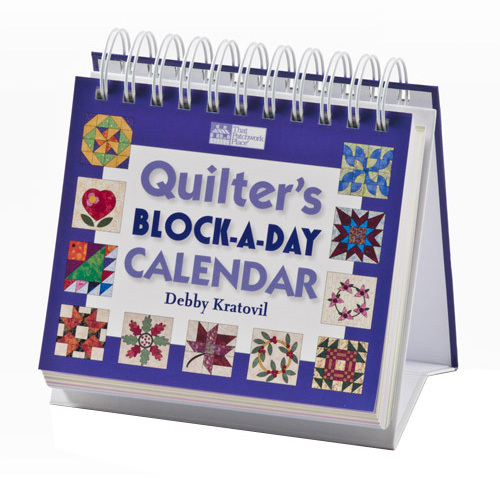 The block for April is Double Cross and appears in my Block a Day calendar on April 6th. Before I show the project, you must see what Patricia in Australia is doing for 2016. She has been making one block a day since January 1. Martingale (my publisher) is showing these blocks on their Facebook page. She not only makes the block but she photographs them in such a clever way. 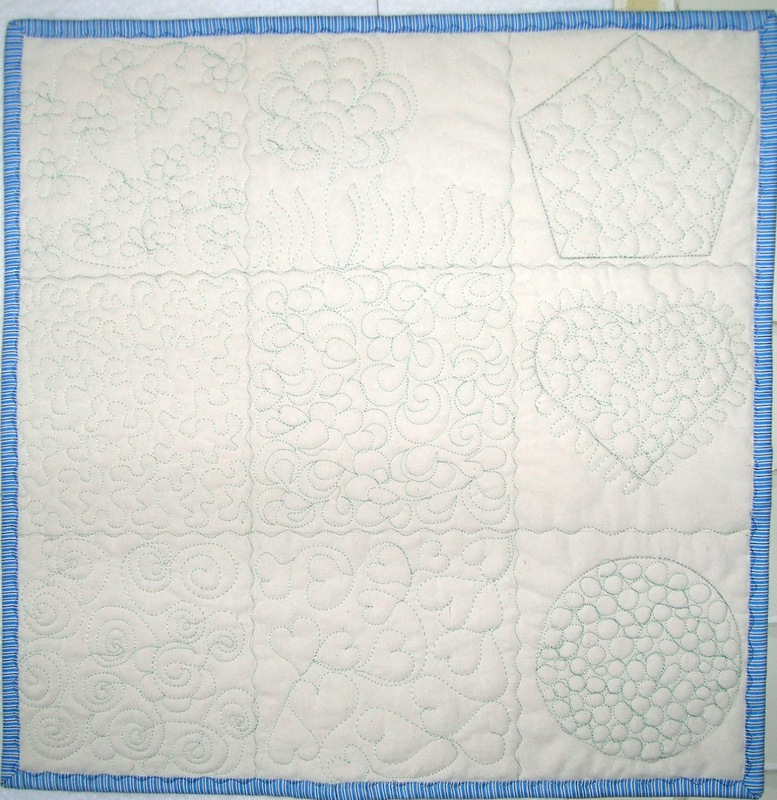 Go visit and see these blocks. 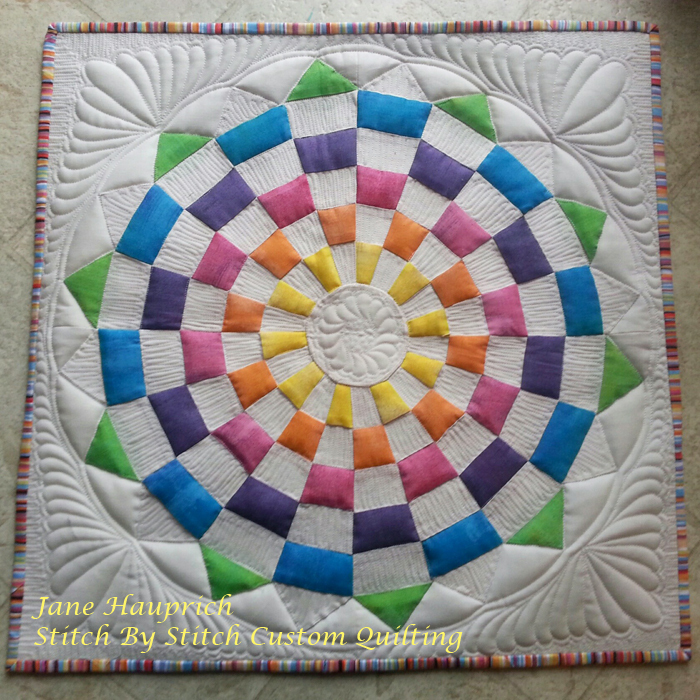 She is up to date and I am so honored and impressed at all her work! Patricia's blocks from my Block a Day Calendar. And a special newsletter with quick sewing tips for making all those triangles. See you in May for our 5th project!